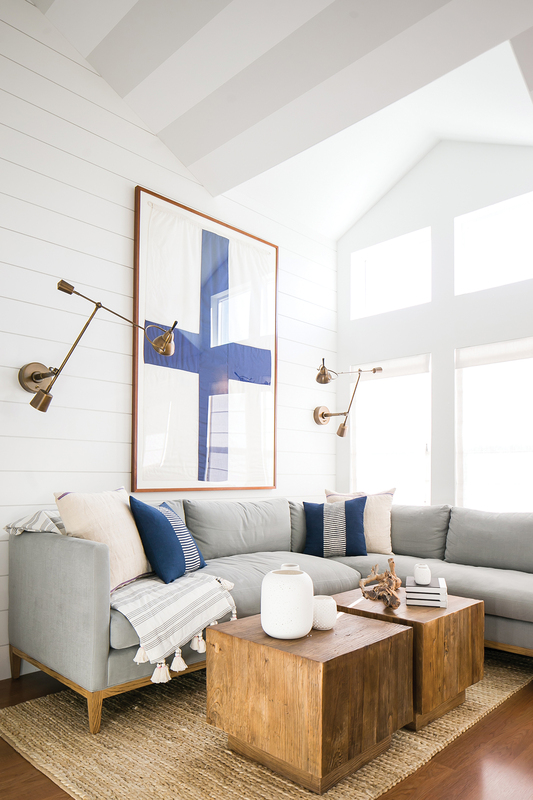 In the living room, a graphic ship’s flag and modern touches make for refined nautical decor. Photograph by Ryan Garvin. Their eldest daughter, who lives in Newport Beach, suggested they look for a weekend place. They perused some condominiums in the area, but nothing resonated. Then someone mentioned the cottages at Lido Peninsula Resort, the charming enclave of manufactured beach homes developed in the mid-’90s adjacent to Newport Bay. They fell for a two-story cottage. That everything they could want was in walking distance sealed the deal. 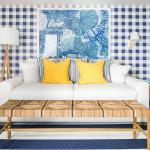 The couple called in Newport Beach interior designer Raili Clasen to transform the plain, beige interior into a light and breezy coastal gathering spot for family and friends. The challenge: It was tiny at 998 square feet. “Mostly, they needed to maximize the cottage and make it feel as spacious as possible,” Clasen says. 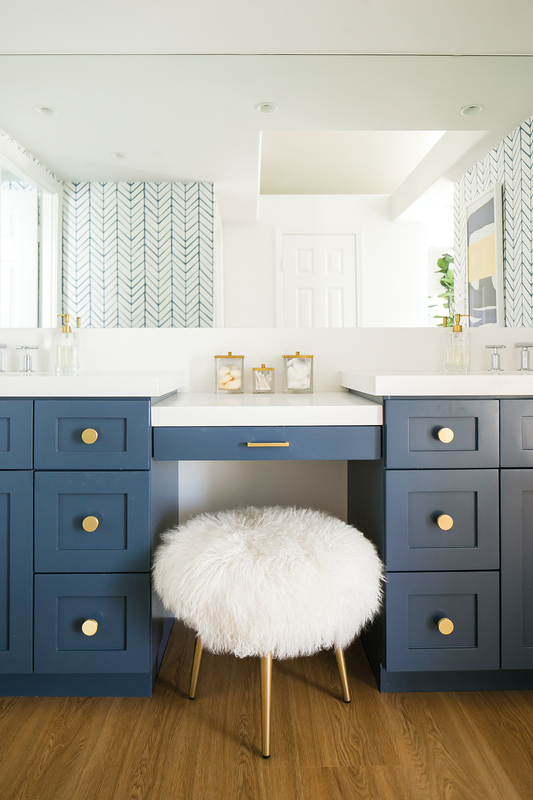 A sheepskin stool softens the bathroom’s navy cabinets. Photograph by Ryan Garvin. They began by taking the house down to the studs. A wall enclosing the small kitchen nestled under the stairs was jettisoned, giving the owners a view of the open-plan living-dining room with its lofty 14-foot ceiling. Substituting four under-counter GE refrigerator-freezer drawers for the full-size refrigerator created more room. An odd-angled kitchen corner under the stairwell, not large enough for a cabinet, now features a built-in wine rack. “When you have a space that small, every inch counts,” Clasen says. There were other creative efforts to maximize the home: A built-in banquette that seats eight doubles as storage and takes the place of more space-gobbling chairs. In lieu of a serving trolley, a new niche built into the stair wall serves as a shallow bar. The designer eliminated the need for end tables and floor lamps in the living room by hanging brass library lamps above her small, custom sofa, then hung a 5-foot-diameter mirror on the opposite wall to reflect the room. To create the beachy ambience the Dickinses requested, walls are covered in crisp-white shiplap and hung with nautical paraphernalia. 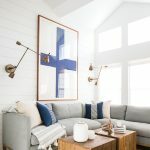 A graphic ship’s flag Clasen found on eBay hangs in the living room; smaller boat flags and sailor rope knots decorate the master suite. A palette of ocean and foamy-white hues, navy painted cabinets in the powder room, azure wallpapers in a variety of patterns, and artwork add to the seaside theme. As a final welcoming touch, Clasen added vinyl letters that spell hello on the cottage’s Dutch door. The couple love to bike, swim, and take their new Duffy boat onto the bay. But the best thing about their home away from home? “We can all be together.” And they no longer fight traffic every time they want to see one of their grandsons’ games. The dining area’s built-in banquette adds extra storage. Photograph by Ryan Garvin. 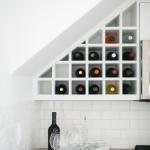 To take advantage of an odd-angled kitchen corner and maximize space, Clasen inserted a custom wine rack. Photograph by Ryan Garvin. 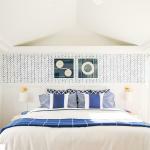 Gingham wallpaper adds playfulness to the guest room. Photograph by Ryan Garvin. Cheryl and Bart Dickins . Photograph by Ryan Garvin.